How Can I Calculate my total points for Canada PR? Canada introduced its Express Entry system in 2018 and since then it has been most popular among the immigration aspirants to this part of the world. Now, moving to Canada has become a point’s game. Got the points by your side, you stand a great chance of making it to Canada as a permanent resident. What is the point based Immigration of Canada? An applicant has to score his best on these factors if he/she wants to be considered for the Canada PR invitation. When you apply for Canada PR through the fastest entry immigration system of Canada, you will get assessed twice based on the above factors. At first stage, when you register your profile on express entry, you need to pass the Federal Skilled Worker (FSW)points criteria by scoring a minimum 67 points out of 100. If you failed to score this much points, you won’t be allowed to apply through EE System. But how one can calculate the points, where is the whole point’s arrangement available. 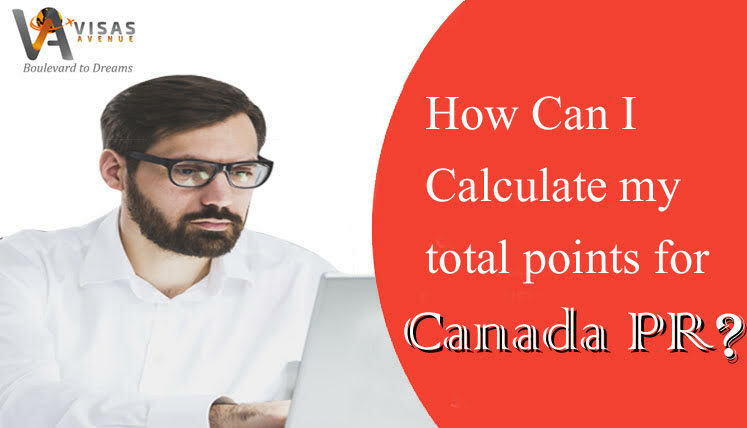 Well, you can get the same calculated either on the official site of Canadian government or can also use the Visas Avenue Canada immigration points calculator to calculate your points. Once you score the required points, you will move to the second stage and reach the Express Entry pool, where your profile will be assessed based on Comprehensive Ranking System (CRS). You will get CRS points out of 1200 points, based on the above-mentioned selection factors, which will form your total CRS score. This score should be close to the current cut off marks or CRS score requirement being demanded by the IRCC (Immigration Refugees and Citizenship Canada) to allocate permanent residency invitation to the applicants. As per the last express entry draw launched in the first half of November, the CRS score requirement from IRCC is 449 CRS points or above. If your CRS Score is close to this mark, you stand a strong chance of getting an Invitation to Apply Canada PR from Immigration Refugees and Citizenship Canada (IRCC). You may check your total immigration points for FSW category as well as in the express entry pool, i.e. CRS Score. Moreover, if you have any difficulty in calculating your points you may forward your details to get your total Canada immigration point checked by the qualified immigration expert at Visas Avenue Immigration. You may contact Visas Avenue migration experts on Toll-Free Number- 78-18-000-777. Moreover, to get your eligibility checked and subsequently, receive a call from the expert, you may fill the free assessment form.